The NanoVault gunsafe provides an affordable, compact, and secure means for gun storage. This safe is constructed with precisely crafted 18 gauge steel to eliminate forced entry. The NanoVault gunsafe meets TSA guidelines and each safe includes a high-strength 4' long, 1,500 lb. test steel cable. This safe is easy to open with its included key and the insides of the safe are lined with a foamed pad to prevent jostling. Used it on my first trip to the range. Very portable and works very well in my backpack. At home, it sits perfectly on my desk locked. Very easy to unlock usif the key. Two thumbs up!!! Bought this one day and received the next. Hard to beat that performance! 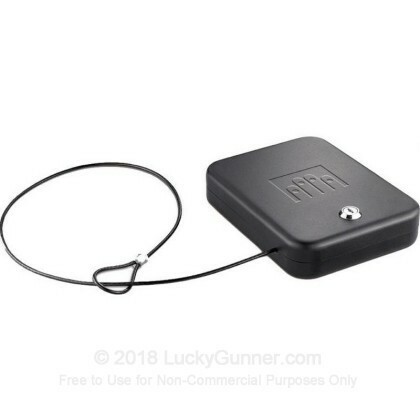 This is a cool little safe and it's pretty cheap too. It appears to be well made with tight seams and the cable works great to secure it to my bolted down truck seat for under-seat storage. A: This safe does not include a certified fire rating.